There could be extraterrestrial life on Comet 67P/Churyumov-Gerasimenko, the target of the European Space Agency’s Rosetta orbiter. That’s according to a couple of UK-based scientists who claim that features on the comet’s surface could be explained by microorganisms beneath the crust. 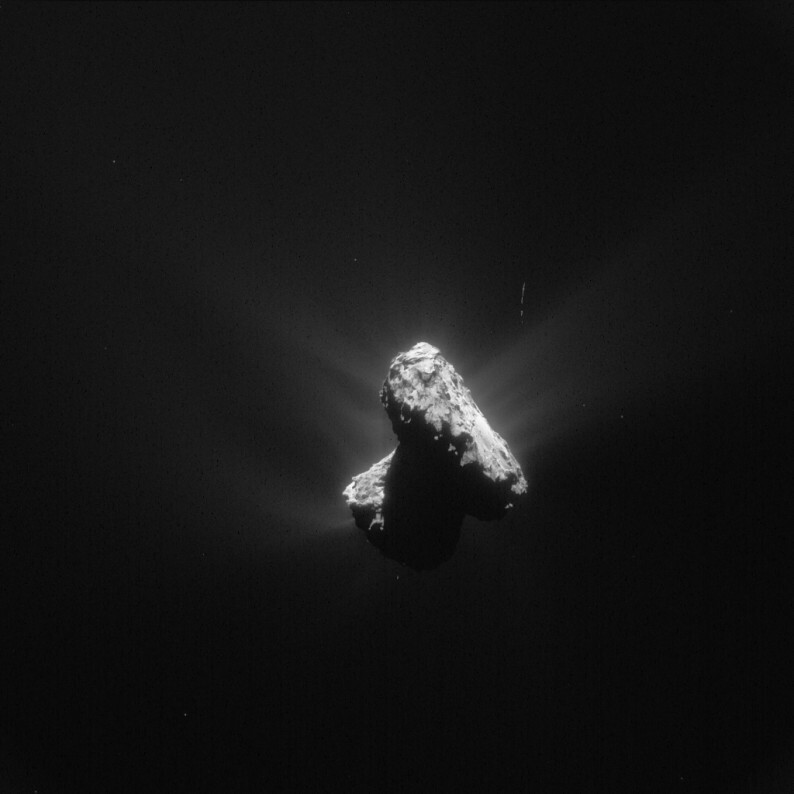 It’s a radical view, and a controversial one, but astrobiologists Max Wallis from the University of Cardiff and Chandra Wickramasinghe, director of the Buckingham Center for Astrobiology, claim data from the Rosetta mission backs up their theory that the comet could harbour some form of life. “That’s the conclusion that we’ve come to,” said Wickramasinghe in a phone call. He argues that comets could transport life through the galaxy, a theory that would have great implications for our origins and the nature of biology. “The implications would be that life is a truly cosmic phenomenon, not restricted to the Earth,” Wickramasinghe said. The European Space Agency’s Rosetta spacecraft has been chasing Comet 67P for years, and made headlines last year when it began to orbit the comet and successfully sent a lander, Philae, onto the surface. Data from the orbiter and lander’s instruments is starting to be published and we’re getting to know more about the rubber ducky-shaped comet. We’ve found organic compounds, and know that the dark surface of 67P is peppered with craters and fissures. “The whole of the geometry of the comet, we have argued, is due to the processes of this kind,” he said. The researchers published a paper relating to their theory in the Journal of Astrobiology and Outreach, and Wallis presented it today at the Royal Astonomical Society’s National Astronomy Meeting in Wales. First look: Kindle Paperwhite an easy read.